Let's start with the basics and one thing that I always see about 'cons' of the vegan lifestyle is that it's more expensive which isn't the case at all. In my opinion any lifestyle (whether you eat meat, you're a vegetarian or if you're vegan), is as expensive as you make it - you can buy the most expensive cuts of meat or delicacies; alternatively you can buy the most inexpensive items. 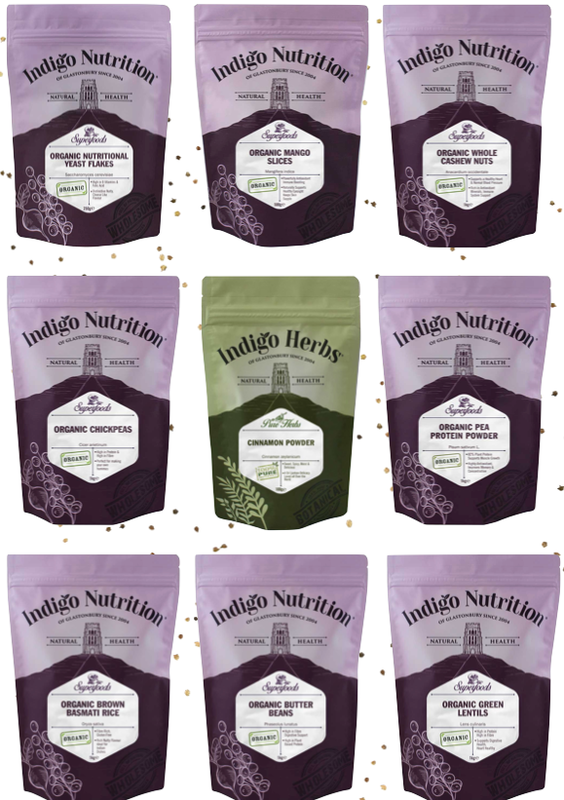 Rice, beans and pulses are some of the cheapest foods, although organic foods do tend to be a little pricier (you obviously don't have to buy organic if you don't want to) but I think that Indigo Herbs has an amazing range of organic wholefoods at really reasonable prices! They have a wide range of rice and lentil varieties. I use rice quite a lot for vegan fried rice *drools*, sushi bowls or stir frys. Additionally, beans such as butterbeans are ideal for adding an interesting texture and protein to your salads or blended with plant milk into a creamy dressing or dip (you do need a high powered blender for this though, I use my Nutribullet). Next up are essentials for anyone, herbs and spices. I use dried herbs and spices every single day and some of my favourites have to include basil (with pasta or salad), tarragon (with pasta, dips, dressing or sauce), garlic pepper (on pretty much everything), chives (for vegan ranch) and nutmeg (great with creamy pasta or eggs/egg replacer). One cooking ingredient that I hadn't heard of until becoming vegan is nutritional yeast. Nutritional yeast is deactivated yeast, that's all, it's nothing unusual but it has such a nice savoury, nutty and slightly cheese flavour. To me it isn't very cheesy (although some people think it is) but I think it's more like salted crisps...I love it blended into cheese sauce or sprinkled onto salad or pasta. Speaking of cheese sauce, the most delicious vegan cheese sauce is made with soaked cashew nuts. I've already posted a recipe for vegan mac 'n' cheese using a cashew based sauce so you can check it out for the recipe - I also have an updated low fat version recipe. Nuts are high in fat so I only tend to use them on occasion but soaked cashew nuts blended with plant milk and herbs makes the most incredibly smooth, super creamy and yummy sauce - you don't need single cream when you can use cashew nuts! Last but not least is another item I don't use too often but it's something I sometimes use in my smoothies - protein powders. I think they'd be great if you are more into your fitness or if you don't want to include other protein sources in your diet. I've tried a couple of pea protein powders and they have been my favourites so far. Are you vegan or vegetarian? Are any of these foods part of your diet? Have you bought anything from Indigo Herbs? I'd love to try having a few vegan days during the week. I dont think I can commit to it forever but trying new recipes and foods excite me. This is a really informative post, especially for anyone thinking about going Vegan. Not vegan but these products sound great. I love Indigo Herbs, their chocolate kit is amazing as well! I’ve not heard of this brand, they look fab though! I'm vegetarian and use a lot of these ingredients. Nutritional yeast is something I've come across a lot but haven't got around to tasting yet though. I'm not vegan, but I do like to eat vegan when I can. Thank you for sharing! I'm moving house and I threw out almost all of my spices and herbs as they were out of date. I need to invest in a new collection. This is such an informative post lovely! It's funny because I always think it would be more expensive too! These look good, cinnamon and cardamom in my tea is a must! Ooooo they all look so good! I'm not vegan or veggie though! I’ve not tried any of these before, they sound so good!